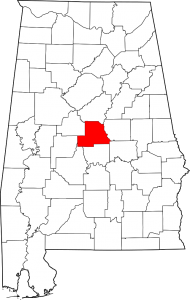 Chilton County is a county of the U.S. state of Alabama. As of the 2010 census, the population was 43,643. The county seat is Clanton, Alabama. Chilton County was named in honor of William Parish Chilton, Sr. (1810–1871), a lawyer who became Chief Justice of the Alabama Supreme Court and later represented Montgomery County in the Congress of the Confederate States of America. In 2010, the center of population of Alabama was located in Chilton County, near the city of Jemison, Alabama, an area known as Jemison Division – The Jemison Division is a County Subdivision of Chilton County. The subdivision has a Z5 Census Class Code which indicates that the Jemison Division is a statistical county subdivision. 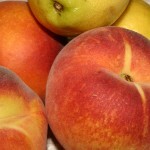 The county is known for its peaches and its unique landscape. It is home to swamps, prairies and mountains due to the foothills of the Appalachians which end in the county, the Coosa River basin, and its proximity to the Black Belt Prairie. The Southwestern part of the Alabama gold belt includes portions of Chilton County. Nuggets weighing up to 4 ounces have been reported from Blue Creek, a short tributary of the Coosa River in the southeastern part of the county. 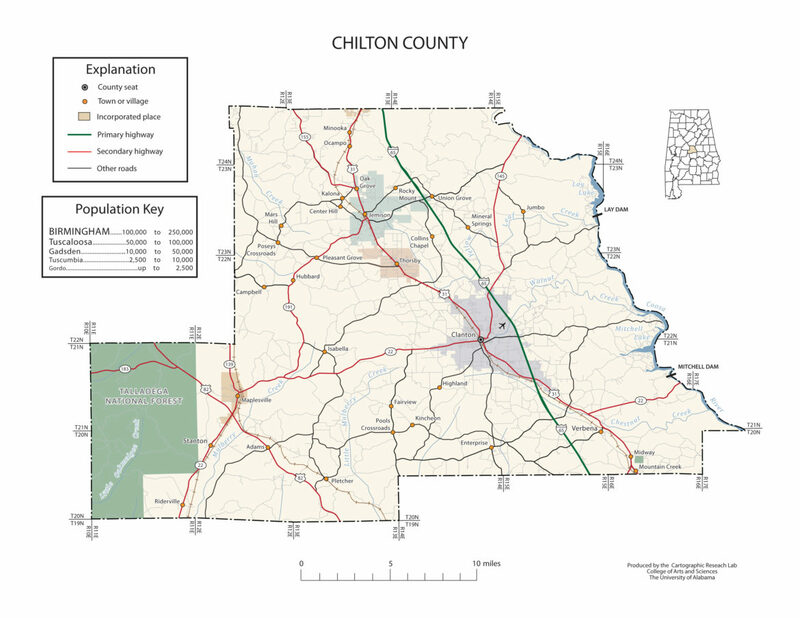 Chilton County, Alabama population is 43,643. The county seat is Clanton, Alabama. Chilton County was originally named Baker County when created in 1868 but was renamed in 1874. Calera is a city in Shelby and Chilton counties. The city limits extend southward into Chilton County along U.S. Route 31, the main highway through the city. Interstate 65 passes through the eastern side of the city, with access from exits 228, 231, and 234. It is the location of the Shelby County Airport. Calera’s population in 2010 was11,620. Clanton is a city in Chilton County, Alabama. At the 2010 census the population was 8,619. The city is the county seat of Chilton County. Clanton is the site of the geographic center of Alabama. Nearby Lay Lake Dam and Mitchell Dam became Alabama Power’s first two dams in the state. Jemison is a city in Chilton County, Alabama. At the 2010 census the population was 2,585. The center of population of Alabama is located outside of Jemison, an area known as Jemison Division. Jemison, is located at the geological end of the Appalachians and was originally inhabited by the Creek Indians for the springs located in the area. In 1869, R.J. Langston built the first house in area and it was made famous by stagecoach drivers who would stop to rest on their travels between North and South Alabama, calling the area Langston Station, or Langstonville, later known as “Jemison Springs,” and finally, Jemison, Alabama. Maplesville is a town in Chilton County. At the 2010 census the population was 708.The town of Maplesville first began to grow in a location 3 miles east of its present location, near Mulberry Creek. European settlers migrated to the area from Georgia and the Carolinas following the Battle of Horseshoe Bend in 1814, after the Native Americans who had been living there were defeated. The town was located at the crossroads of two important trading routes: the Elyton Road from Selma to Birmingham, and the Fort Jackson Road from Tuscaloosa to Montgomery. Thorsby is a town in Chilton County, Alabama. As of the 2010 census, the population of the town was 1,980. Thorsby was first settled in 1895 and incorporated in 1901 by Scandinavian immigrants who had originally settled in the midwestern United States. The town grew quickly, with two hotels, a sawmill and lumber company, and two wineries being built within the first couple of years. Isabella, also known as Benson or Bensen, is an unincorporated community in Chilton County, Alabama. Jumbo is an unincorporated community in Chilton County, Alabama. Mountain Creek is an unincorporated community in southeastern Chilton County, Alabama. Mountain Creek was the site of the Alabama Confederate Soldiers Home from 1902 to 1939, which is now the Confederate Memorial Park. The 102-acre park has a museum, research facility, historic structures, ruins and two cemeteries with the graves of over 300 Confederate soldiers. Stanton is an unincorporated community in Chilton County, Alabama. Verbena, also known as Summerfield, is an unincorporated community in southeastern Chilton County, Alabama. Named for the indigenous flower, Verbena developed into a popular resort location for the more affluent citizenry of Montgomery, the state’s capital, during the yellow fever outbreaks of the late 19th and early 20th centuries.